ew cost-effective, entry-level mobiles expand Hytera’s DMR portfolio and make the switch from analogue to digital even easier for commercial users. 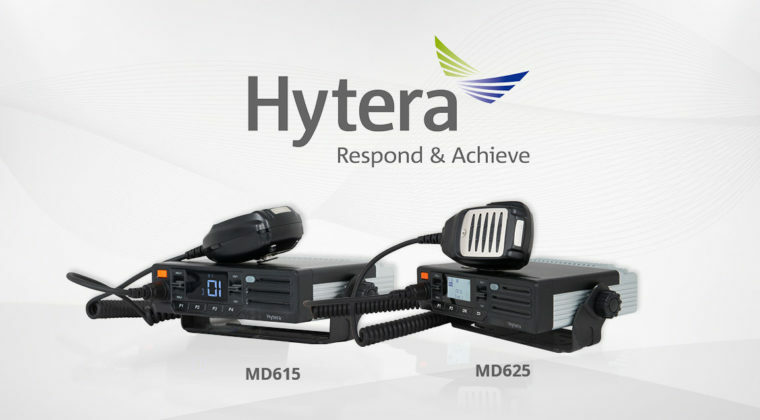 Hytera has launched two new DMR mobile radios primarily aimed at users looking for a versatile commercial device. The mobile radios are simple and easy to use and provide the perfect first step for those looking to migrate from analogue to digital. The MD615 and MD625 are DMR Tier II conventional radios designed for commercial users to install in vehicles for applications such as logistics, transportation and agriculture, or alternatively to use as a simple desktop device. In terms of the Hytera DMR portfolio, the radios provide a new entry-level digital product positioned below the existing mid-tier MD655 and high-tier MD785 mobile radios. Both radios deliver excellent audio quality thanks to the latest Hytera digital technology. They support both analogue and digital modes enabling mixed fleets, as well as providing a smooth migration from analogue to digital. The analogue and digital auto detect feature recognises the type of signal being received and automatically switches to the mode, responding to the call appropriately. The MD615 and MD625 are powerful devices capable of transmitting at up to 45W (UHF) or 50W (VHF) if you select the high power version, or up to 25W (UHF & VHF) if you select the low power version. The frequency range in UHF is 400-470 MHz and VHF is 136-174 MHz. The radios weigh 1,100g and are 164 x 43 x 150 mm in size. They are IP54 rated against dust and water intrusion and are MIL-STD-810 G certified for shock and vibration. Both radios are fitted with an emergency button on the front panel, a 4W internal speaker, audio/programming port, along with volume and channel controls on the front. Bluetooth 4.2 capability is also built into the front panel as a factory option if specified. This can support multiple wireless audio accessories including the POA121 Bluetooth Ring PTT and ESW01 Bluetooth earphone for hands free, safe driving. The rear panel houses the BNC RF antenna connection port, DC power supply, DB26 accessories port and a GPS connection port into which an optional external GPS module can be plugged in. The GPS feature enables real-time positioning of vehicles on a map using Hytera dispatch software. The key differences between the two radios are that the MD615 has 5 programmable buttons, supports a channel capacity of 48 channels over 3 zones, with a two digit LED display. The MD625 has 3 programmable buttons and supports data capabilities such as call alias, contact list, call history and thanks to the 1.5 inch LCD display it can also support text messaging. Channel capacity is much larger as it supports 256 channels over 16 zones. Hytera has designed a new 8-pin remote control head connector and programming cable, which is smaller and slimmer than previous models. Customers with MD655 and MD785 radios should note their existing front panel accessories are not compatible with the new MD615/625 models. The new port will support the SM11A1 palm microphone and PC109 programming cable. However, the rear panel DB26 connection port will share almost all the same accessories with the MD655/785, including SM09D1 external speaker, POA44 foot switch PTT, PWC10 power cord and PC60 ignition cable. The MD615 and MD625 support Hytera pseudo trunk technology, which enables two voice channels to be automatically assigned dynamically to allow several talk groups to communicate in the same frequency. This increases the radio capacity and enables more than two talk groups at no extra cost or frequency license. It must be noted that XPT is not supported by these new commercial mobiles. Customers can also use Hytera’s radio registration service (RRS), which provides an information link on a DMR Tier II system when connected to a Hytera Dispatch console. This allows dispatchers to check the status of each radio as to whether they are on/off or in/out of range and generally improves fleet management. Other features shared by both radios include: support for DTMF and HDC1200 (coming soon) signalling in analogue mode; two simultaneous voice calls in direct mode thanks to DMR TDMA technology; and basic end-to-end encryption for voice and data. In addition, roaming is included as standard for use in large multi-site network, along with further supplementary features such as radio enable/disable, remote monitor and priority interrupt. Both the MD615 and MD625 radios are available now. Please contact us for more information.